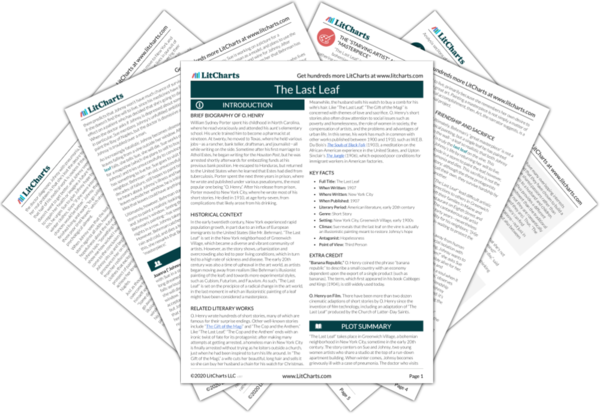 Instant downloads of all 942 LitChart PDFs (including The Last Leaf). 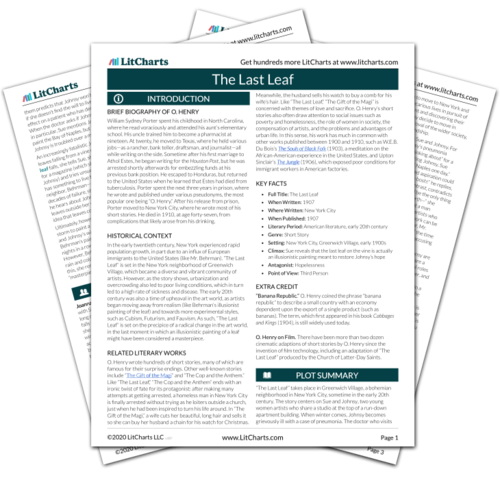 Welcome to the LitCharts study guide on O. Henry's The Last Leaf. Created by the original team behind SparkNotes, LitCharts are the world's best literature guides. A concise biography of O. Henry plus historical and literary context for The Last Leaf. A quick-reference summary: The Last Leaf on a single page. In-depth summary and analysis of every of The Last Leaf. Visual theme-tracking, too. Explanations, analysis, and visualizations of The Last Leaf's themes. The Last Leaf's important quotes, sortable by theme, character, or . Description, analysis, and timelines for The Last Leaf's characters. Explanations of The Last Leaf's symbols, and tracking of where they appear. An interactive data visualization of The Last Leaf's plot and themes. William Sydney Porter spent his childhood in North Carolina, where he read voraciously and attended his aunt’s elementary school. His uncle trained him to become a pharmacist at nineteen. At twenty, he moved to Texas, where he held various jobs—as a rancher, bank teller, draftsman, and journalist—all while writing on the side. Sometime after his first marriage to Athol Estes, he began writing for the Houston Post, but he was arrested shortly afterwards for embezzling funds at his previous bank position. He escaped to Honduras, but returned to the United States when he learned that Estes had died from tuberculosis. Porter spent the next three years in prison, where he wrote and published under various pseudonyms, the most popular one being “O. Henry.” After his release from prison, Porter moved to New York City, where he wrote most of his short stories. He died in 1910, at age forty-seven, from complications that likely arose from his drinking. 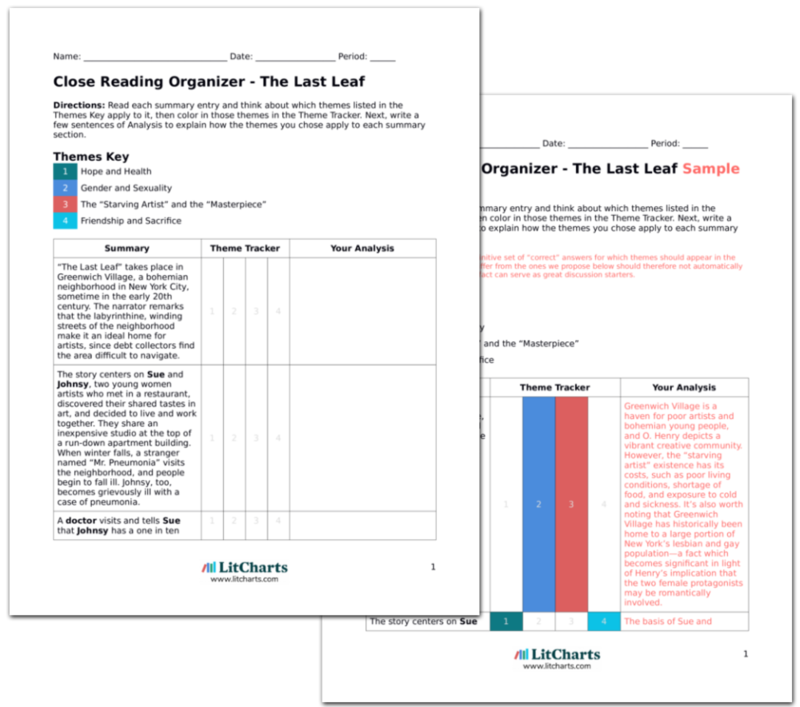 Get the entire The Last Leaf LitChart as a printable PDF. In the early twentieth century, New York experienced rapid population growth, in part due to an influx of European immigrants to the United States (like Mr. Behrman). “The Last Leaf” is set in the New York neighborhood of Greenwich Village, which became a diverse and vibrant community of artists. However, as the story shows, urbanization and overcrowding also led to poor living conditions, which in turn led to a high rate of sickness and disease. The early 20th century was also a time of upheaval in the art world, as artists began moving away from realism (like Behrman’s illusionist painting of the leaf) and towards more experimental styles, such as Cubism, Futurism, and Fauvism. As such, “The Last Leaf” is set on the precipice of a radical change in the art world, in the last moment in which an illusionistic painting of a leaf might have been considered a masterpiece. O. Henry wrote hundreds of short stories, many of which are famous for their surprise endings. Other well-known stories include “The Gift of the Magi” and “The Cop and the Anthem.” Like “The Last Leaf,” “The Cop and the Anthem” ends with an ironic twist of fate for its protagonist: after making many attempts at getting arrested, a homeless man in New York City is finally arrested without trying as he loiters outside a church, just when he had been inspired to turn his life around. In “The Gift of the Magi,” a wife cuts her beautiful, long hair and sells it so she can buy her husband a chain for his watch for Christmas. Meanwhile, the husband sells his watch to buy a comb for his wife’s hair. Like “The Last Leaf,” “The Gift of the Magi” is concerned with themes of love and sacrifice. O. Henry’s short stories also often draw attention to social issues such as poverty and homelessness, the role of women in society, the compensation of artists, and the problems and advantages of urban life. In this sense, his work has much in common with other works published between 1900 and 1910, such as W.E.B. Du Bois’s The Souls of Black Folk (1903), a meditation on the African-American experience in the United States, and Upton Sinclair’s The Jungle (1906), which exposed poor conditions for immigrant workers in American factories. “Banana Republic.” O. Henry coined the phrase “banana republic” to describe a small country with an economy dependent upon the export of a single product (such as bananas). The term, which first appeared in his book Cabbages and Kings (1904), is still widely used today. O. Henry on Film. There have been more than two dozen cinematic adaptions of short stories by O. Henry since the invention of film technology, including an adaptation of “The Last Leaf” produced by the Church of Latter-Day Saints. Houghton, Eve. "The Last Leaf." LitCharts. LitCharts LLC, 7 Nov 2017. Web. 19 Apr 2019. Houghton, Eve. "The Last Leaf." LitCharts LLC, November 7, 2017. Retrieved April 19, 2019. https://www.litcharts.com/lit/the-last-leaf.